Lloyd’s of London always provides a fascinating insight into the London insurance market and beyond into the global specialty insurance market, as this previous post shows. It’s Chairman, Bruce Carnegie-Brown, commented in their 2017 annual report that he expects “2018 to be another challenging year for Lloyd’s and the Corporation continues to refine its strategy to address evolving market conditions”. Given the bulking up of many of its competitors through M&A, Willis recently called it a reinvigoration of the “big balance sheet” reinsurance model, Lloyd’s needs to get busy sharpening its competitive edge. In a blunter message Brown stressed that “the market’s 2017 results are proof, if any were needed, that business as usual is not sustainable”. A looked at the past 15 years of underwriting results gives an indicator of current market trends since the underwriting quality control unit, called the Franchise Board, was introduced at the end of 2002 after the disastrous 1990’s for the 330-year-old institution. The trend of increasing non-CAT loss ratios after years of soft pricing coupled with declining prior year reserve releases is clear to see. That increases the pressure on the insurance sector to control expenses. To that end, Inga Beale, Lloyd’s CEO, is pushing modernisation via the London Market Target Operating Model programme hard, stating that electronic placement will be mandated, on a phased basis, “to speed up the adoption of the market’s modernisation programme, which will digitise processes, reduce unsustainable expense ratios, and make Lloyd’s more attractive to do business with”. The need to reduce expenses in Lloyd’s is acute given its expense ratio is around 40% compared to around 30% for most of its competitors. Management at Lloyd’s promised to “make it cheaper and easier to write business at Lloyd’s, enabling profitable growth”. 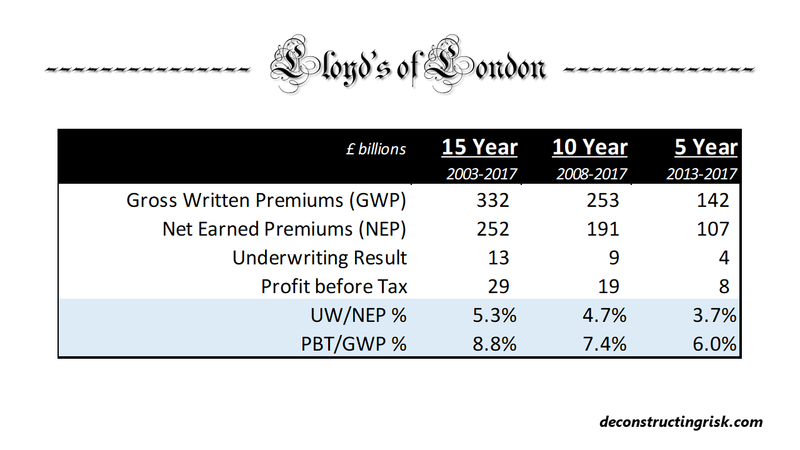 Although Lloyd’s has doubled its gross premium volumes over the past 15 years, the results over varying timeframes below, particularly the reducing underwriting margins, show the importance of stressing profitable growth and expense efficiencies for the future. A peer comparison of Lloyd’s results over the past 15 years illustrates further the need for the market to modernise, as below. 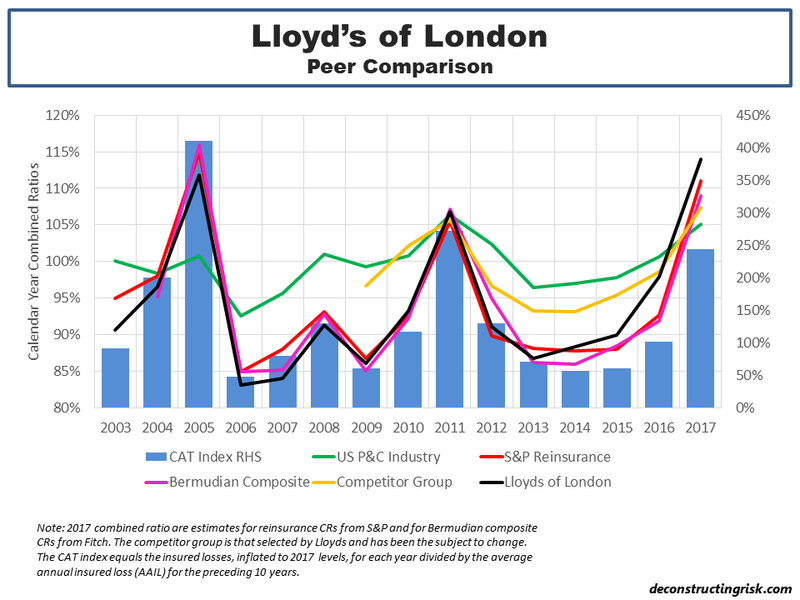 Although the 2017 combined ratio for some of the peer groupings have yet to finalised and published (I will update the graph when they do so), the comparison indicates that Lloyd’s has been doing worse than its reinsurance and Bermudian peers in recent years. It is suspicious to see, along with the big reinsurers and Bermudians, Lloyd’s included Allianz, CNA, and Zurich (and excluded Mapfe) in their competitor group from 2017. If you can’t meet your target, just change the metric behind the target! A recent report from Aon Benfield shows the breakdown of the combined ratio for their peer portfolio of specialist insurers and reinsurers from 2006 to 2017, as below. 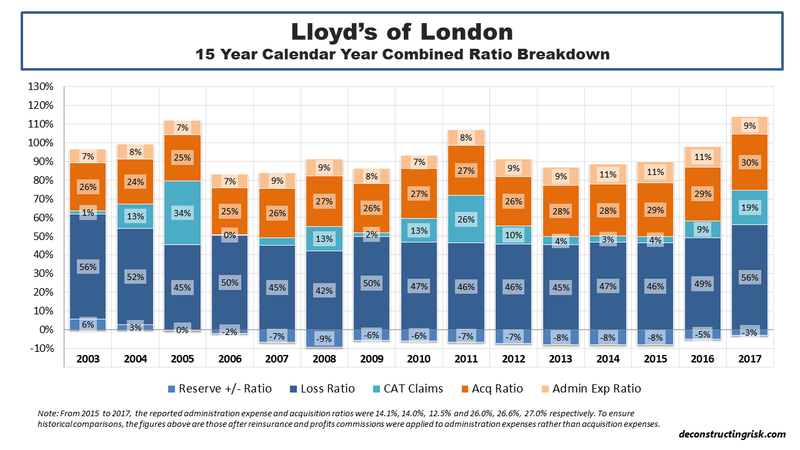 So, besides strong competitors, increasing loss ratios and heavy expense loads, what does Lloyd’s have to worry about? Well, in common with many, Lloyd’s must contend with structural changes across the industry as a result of, in what Willis calls in their latest report, “the oversupply of capital” from investors in insurance linked securities (ILS) with a lower cost of capital, whereby the 2017 insured losses appears to have had “no impact upon appetite”, according to Willis. I have posted many times, most recently here, on the impact ILS has had on property catastrophe pricing. The graph of the average multiple of coupon to expected loss on deals monitored by sector expert Artemis again illustrates the pricing trend. I have come up with another angle to tell the story, as per the graph below. I compared the Guy Carpenter rate on line (ROL) index for each year against an index of the annual change in the rolling 10-year average global catastrophe insured loss (which now stands at $66 billion for 2008-2017). 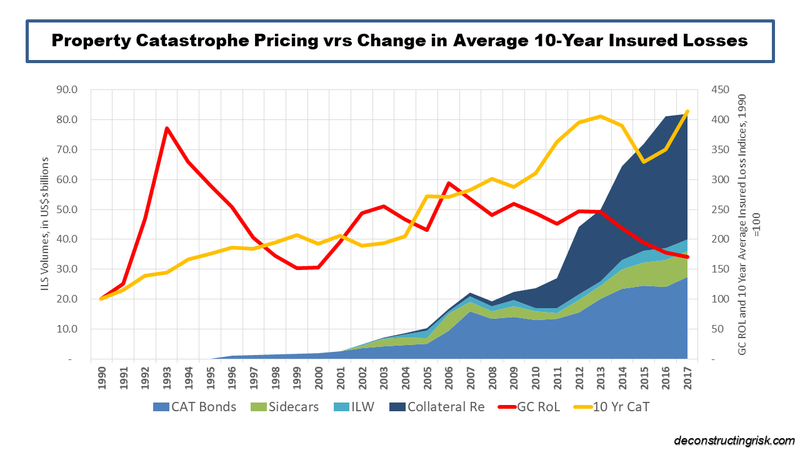 Although it is somewhat unfair to compare a relative measure (the GC ROL index) against an absolute measure (change in average insured loss), it makes a point about the downward trend in property catastrophe reinsurance pricing in recent years, particularly when compared to the trend in catastrophic losses. To add potentially to the unfairness, I also included the rising volumes in the ILS sector, in an unsubtle finger point. Hilary Weaver, Lloyd’s CRO, recognises the danger and recently commented that “the new UK ILS regulation will, if anything, increase the already abundant supply of insurance capital” and “this is likely to mean that prices remain low for many risks, so we need to remain vigilant to ensure that the prices charged for them are proportionate to the risk”. The impact extends beyond soft pricing and could impact Lloyd’s risk profile. The loss of high margin (albeit not as high as it once was) and low frequency/high severity business means that Lloyd’s will have to fish in an already crowded pond for less profitable and less volatile business. The combined ratios of Lloyd’s main business lines are shown below illustrating that all, except casualty, have had a rough 2017 amid competitive pressures and large losses. As reinsurance business is commoditised further by ILS, in a prelude to an increase in machine/algorithm underwriting, Lloyd’s business will become less volatile and as a result less profitable. 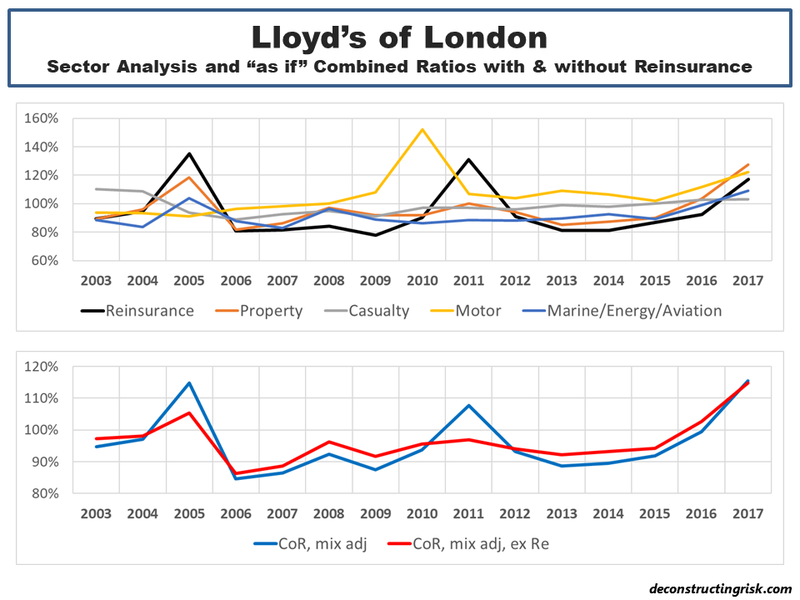 To illustrate, the lower graph below shows Lloyd’s historical weighted average combined ratio, using the 2017 business mix, versus the weighted average combined ratio excluding the reinsurance line. For 2003 to 2017, the result would be an increase in average combined ratio, from 95.8% to 96.5%, and a reduction in volatility, the standard deviation from 9.7% to 7%. To write off Lloyd’s however would be a big mistake. In my view, there remains an important role for a specialist marketplace for heterogeneous risks, where diverse underwriting expertise cannot be easily replicated by machines. Lloyd’s has shown its ability in the past to evolve and adapt, unfortunately however usually when it doesn’t have any choice. Hopefully, this legendary 330-year-old institution will get ahead of the game and dictate its own future. It will be interesting to watch. Epilogue – Although this analogy has limitations, it occurs to me that the insurance sector is at a stage of evolution that the betting sector was at about a decade ago (my latest post on the sector is here). Traditional insurers, with over-sized expenses, operate like old traditional betting shops with paper slips and manual operations. The onset of online betting fundamentally changed the way business is transacted and, as a result, the structure of the industry. The upcoming digitalisation of the traditional insurance business will radically change the cost structure of the industry. Lloyd’s should look to the example of Betfair (see an old post on Betfair for more) as a means of digitalising the market platform and radically reducing costs. Follow-on 28th April – Many thanks to Adam at InsuranceLinked for re-posting this post. A big welcome to new readers, I hope you will stick around and check out some other posts from this blog. I just came across this report from Oliver Wyam on the underwriter of the future that’s worth a read. They state that the “commercial and wholesale insurance marketplaces are undergoing radical change” and they “expect that today’s low-price environment will continue for the foreseeable future, continuing to put major pressure on cost“.